I am sharing this post in partnership with Traeger Grills . As always, all opinions are 100 percent my own. Thank you for the continued support of brands I work with, making it possible for me to continue creating quality content for you. 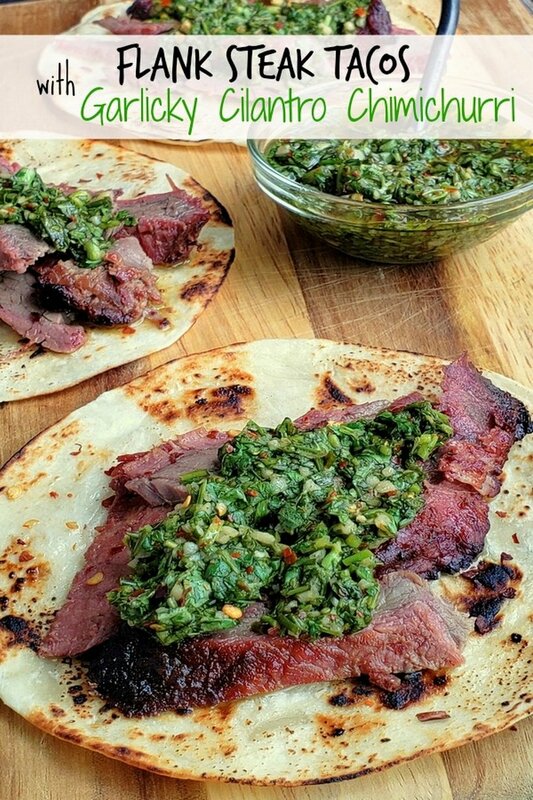 Make the best street food at home with these Flank Steak Tacos with Garlicky Cilantro Chimichurri. These tacos are essentially going to be your go-to summer, grilling meal. 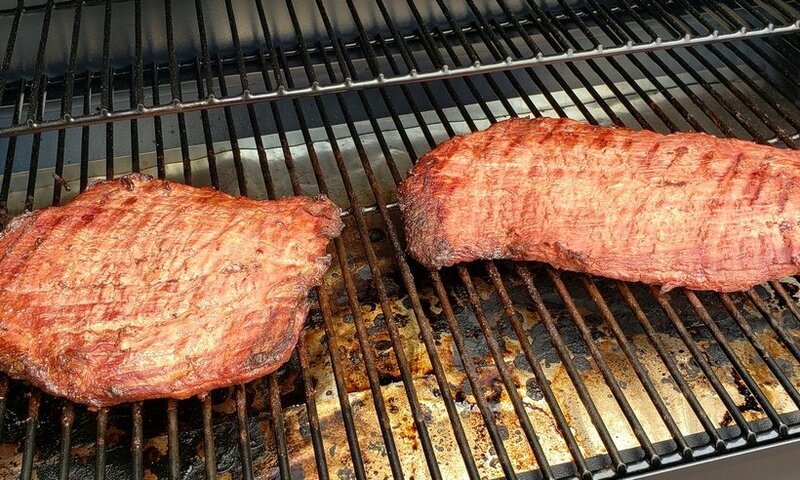 Hey taco fans, it doesn’t get much better than delicious flank steak, grilled to perfection on a Traeger Grill. 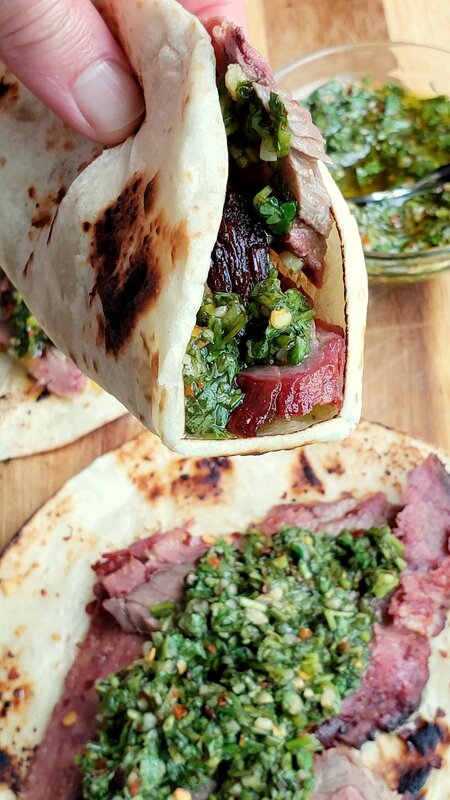 In fact, the smoked kissed meat is so tender and delicious, all you need is a simple chimichurri sauce to round out the meal. Flank steak is one of my absolute favorite cuts of beef. When prepared properly it is honestly one of the best meals you’ll ever have. The chimichurri sauce is classically made with parsley and red wine vinegar, however, I thought I’d change that too with some bright, zesty ingredients. I promise you are going to love it. Warming up your tortillas is also a must, adding another layer of flavor to this meal. When Traeger Grills asked me to partner with them to share some recipes and try out one of their grills, I honestly could not have been more excited. I am surrounded by neighbors who all have a Traeger Grill and it appeared I was the last one on the block without one. Luckily, I’ve been saving the perfect spot on my deck for this particular Traeger model. Why a Traeger wood pellet grill as opposed to a gas or charcoal grill? First and foremost it’s the versatility. With a Traeger grill you can smoke, grill, bake, roast, braise and barbecue. 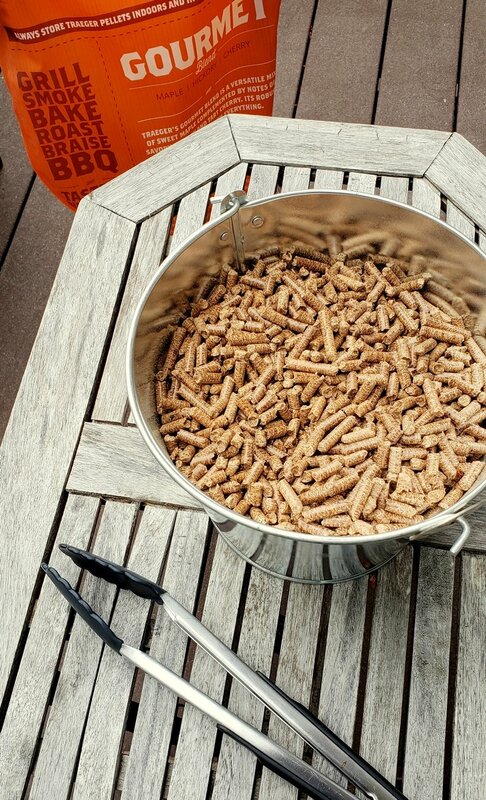 The hardwood pellets naturally enhance the flavor of whatever you’re cooking and they come in a variety of flavors. Mesquite and pecan flavored pellets are a couple of my all-time favorites. Because a Traeger grill manages the temperature for you, you don’t have to babysit your meat. A temperature probe will let you know when your meat has reached the level of doneness you’re trying to achieve. Once your meat is on the grill, you can attend to the other parts of your meal. It’s that easy. I love chimichurri. If you’re not familiar with this beloved Argentinian condiment, it’s time you gave it a try. It’s traditionally made with parsley as previously mentioned. So if you happen to have an aversion to cilantro, by all means substitute parsley in this recipe. Red wine vinegar is often used to bring acidity to traditional chimichurri, however, I prefer using a pungent white wine vinegar, fresh lemon juice and zest for a pop of flavor. 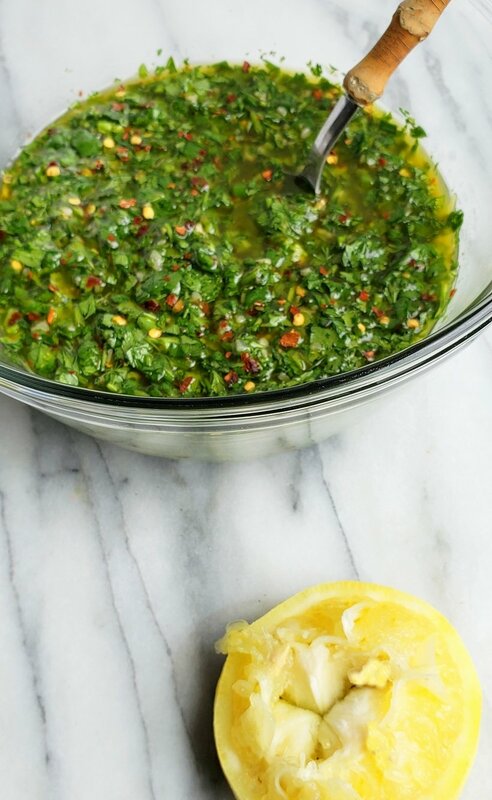 Adding loads of minced garlic make this the best chimichurri you will ever taste. I seriously mean that. You will not be able to stop smothering this on top of your flank steak. How delicious does this look? And you can see the smoke ring on the meat too. So much flavor right here and another reason cooking on a Traeger grill is so special. You can easily char your tortillas over a gas flame on the stove, in a heated pan or throw them right on the grill before your meat is finished. They are a really nice addition to this meal. I can’t get enough of these pictures. I just want to eat this meal again and again. Best bite in town. Don’t forget to invite the neighbors over for a barbecue this summer. 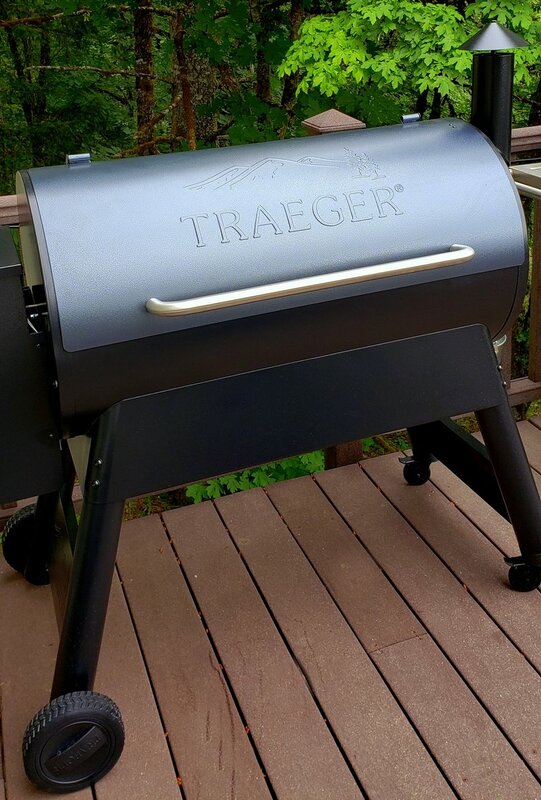 Do you have a Traeger grill? Tell me about your favorite recipe to make using it. I am thinking about making this Smoked Pulled Pork on Traeger grill, it looks delicious. This Easy Smoked Chicken, also done on a Traeger looks equally delicious. I also can’t wait to smoke a turkey breast using my Traeger grill! And have you ever thought about grilling pizza on your Traeger grill? I can’t get it out of my mind now. Three years ago I showed you how to make the Perfect Silver Dollar Pancakes every time. Have you made them yet? Five years ago I entered this Creamy Dill-White Bean Manicotti in a contest. It’s that good! Seven years I posted about the Best Ever Rice Pudding and it’s still a family favorite. Add all marinade ingredients to a large Ziploc bag and let meat sit overnight in the refrigerator. Remove meat from refrigerator and bag 30 minutes prior to cooking. In a medium bowl combine cilantro, garlic, oregano, white wine vinegar, lemon zest and juice, red pepper flakes and kosher salt. Whisk in olive oil. When ready to cook the meat, start your Traeger grill on smoke with the lid open until the fire is established (4-5 minutes). Set the temperature to 450 degrees F (high) and preheat, lid closed, for 10 to 15 minutes. Lift the flank steak from the marinade (discard the marinade) and place on the grill grate. Grill with lid closed for 10-12 minutes on each side. However, grilling time will dependent on the thickness and starting temperature of your steak, so it can vary by a lot ~ longer or shorter. Feel free to use the temperature probe and grill to medium-rare. Transfer the steak to a cutting board and let rest for 5 minutes. Slice thinly on the diagonal across the grain. 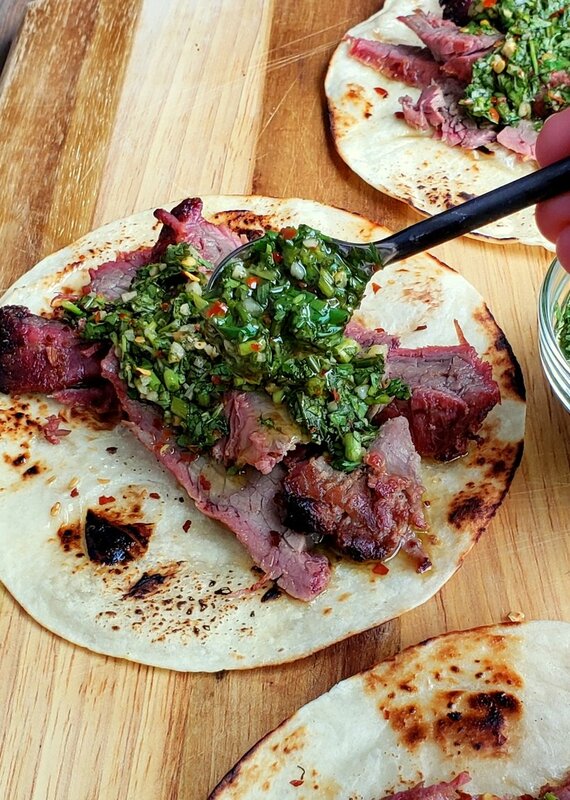 Serve immediately with warm tortillas and chimichurri sauce. Sadly, I have no yard, so no grill of any kind for me. However, you have given me some inspiration for what to do with a bunch of leftover cilantro from this past weekend I have sitting in the kitchen. I like your marinade too. My next steak dinner is all set! 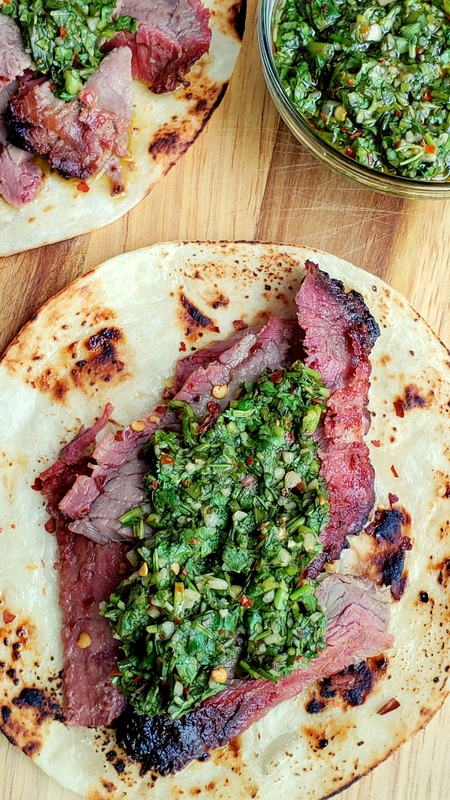 We totally love grilling flank steak at our house all summer long! This looks like a good way to make it! These look absolutely amazing! I love chimichurri!! 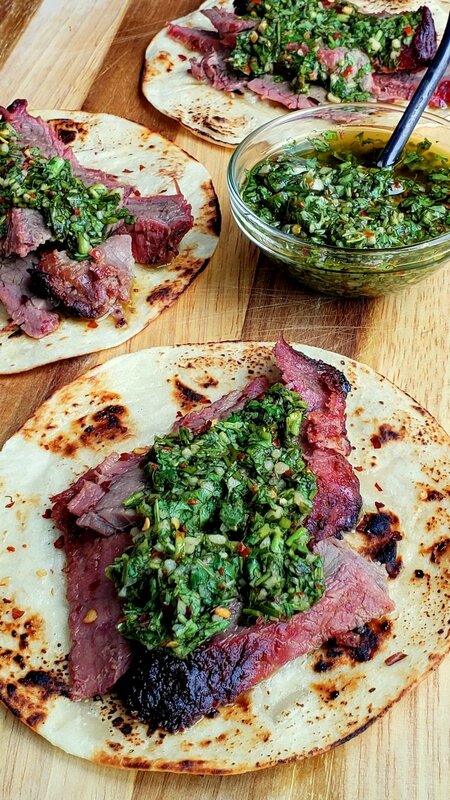 Flank steak is one of our favorites, too, plus I adore chimichurri! These tacos are fantastic!! Traegers are the best and these tacos have so much flavor! Wow that grill! !i love every part of this meal. That sauce is fantastic! !